The Prospect Gardens apartment complex is located at the crest of Science Hill, at the corner of Prospect and Division Streets. 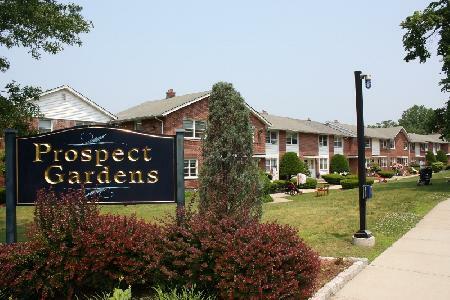 The name �Prospect Gardens� comes from its layout of alternating buildings and courtyards, which resembles the rows of a garden. The center courtyard acts as the focal point of life at Prospect Gardens, with a playground, benches, and picnic tables to enhance communal enjoyment. The Yale shuttle bus makes regular stops at the top row of Prospect Gardens, making these apartments convenient for tenants working in downtown or at the medical campus. All 2BR townhouses feature a living room and kitchen on the first floor, two bedrooms and a bathroom upstairs, and a basement for storage, including washer and dryer hook-ups. Forty-four units include one off-street parking space. The other thirty-seven units have private garages underneath. The apartments feature hard-wood floors, and tenants pay for heat (gas), electricity, and hot water.